Follow along as Sara Adams demonstrates how to fold a little origami rabbit right here. The bunny is designed by Jun Maekawa. 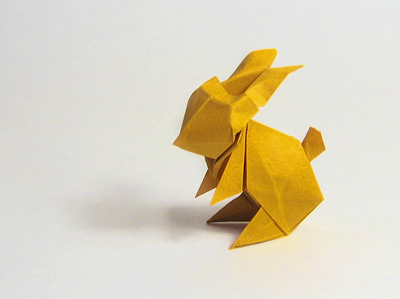 I have no idea how a person picks up a sheet of paper and figures out how to fold a three-dimensional rabbit from it. Amazing. Amazing, indeed! It must take a special 'eye' or something! One that I sure don't have! omigosh i totally love this! That is the sweetest bit of paper i've ever seen! It's nice to see here an example of my childhood hobby! So lovely, thanks for sharing. I like non chocolate easter gifts as well. I too used to wonder how people could create something just by folding a piece of paper. As I have practiced it, I find that origami is a bit like music or like painting. We learn the basics notes or color combinations, and little by little we start to add "vocabulary" until one day we are able to do something on our own. One year, I got my daughter (then around 10 years old) a Klutz origami book as backseat entertainment for a long trip. She loved it, and the car was soon overtaken by numerous paper critters -- including a rabbit that kept sliding off the dashboard, earning the moniker, "the suicidal bunny." I wish I could do more than an origami fan...this is amazing! I've been waiting for you to post an origami bunny for Easter! This looks like a challenge but worth it! I mean, check out the little bunny hands! I'm linking you up to my blog. Hope you don't mind. Funny cause my daughter and i were just wondering the same thing---how do people imagine these things up? It took me a while to make but this video is very clear. Thanks for sharing - cheered up my day. This is such an adorable rabbit! I can't wait to try it.